Lord Vishnu is the all-pervasive Lord who expands into everything. He is the maintainer of the universe and the complete cosmic creation. He is called Vishnu because He overcomes all.1 He represents sattva-guna, or the mode of goodness by which everything is sustained. He is also called Narayana, which means the shelter, resting place or ultimate goal of all living entities. It also means the one whose abode is the causal waters (Karana Ocean), and one who lives in the hearts of all living beings. It is this sattva nature which gives the living beings the tendency to grow toward a higher truth, the light, a more cohesive and intense reality. In this sense, Lord Vishnu is also called Hari, or one who removes the darkness of illusion. This illusion ultimately means the idea that the living beings live separate from, or without connection to, the Lord. Lord Vishnu is often portrayed resting on the huge serpent of Sesha. We see that the thousand heads of Sesha are all turned inward, representing a tranquil mind, and looking toward the Absolute Truth of Lord Vishnu. Lord Vishnu is also seen in the yogic sleep called yoga-nidra. The yoga-nidra (yoga or the root yuj meaning to connect or join) is a cosmic sleep wherein the Lord is focused on the Infinite Reality of His own identity. Lord Vishnu is also seen standing on the whirl of a lotus flower with four hands, which represent the four directions and indicates His absolute power in the four corners of the universe. Each hand holds an item, such as a disc, lotus, conch, and mace. Of the four items, the conch represents the five universal elements. When the conch is blown, it is said to produce a sound related to the original vibration of universal creation. The Lord also blows His conch in calling everyone to turn to the higher reality rather than remaining in the darkness of material existence. This calling is the inner voice which nudges all beings of conscience to seek the Absolute Truth. If man does not heed the call, then the Lord may still use His conch to cut asunder the ego and material attachments of those who do not turn toward the spiritual path. The disc or chakra signifies the universal mind or awareness.3 It rids all darkness wherever it appears, and thus shows the path to higher awareness. The disc is called Sudarshan, the limitless power and light that destroys all forms of ignorance. Thus, Lord Vishnu allows it to cut off the heads of envious demons. It has six spokes and shows the revolving nature of the universe (maya) around an unmoving and changeless center. The Sudarshana Chakra, when shown alone, is often viewed as a person with four, eight, or sixteen arms, holding such items as a bow, arrow, trident, noose, and a poker. These are said to represent the will and power of the Lord to not only create but to also destroy the universe. The mace represents the cosmic intellect or knowledge. It is called Kaumodaki, meaning that which captivates the mind. It is also associated with time, which destroys all, and is thus also related to Kali, the power of time.4 When pictured as a deity, it is viewed as a female with two hands, positioned in respect. The lotus being twirled in His hand shows the revolving or changing nature of the universe.5 It also indicates the real purpose of human existence, which the Lord invites all to follow. The Vaijayanti garland (garland of victory) with five rows of flowers that the Lord wears indicates the five senses and the Lord’s illusory power which affect the senses.6 Its fragrance represents the subtle elements found within the material manifestation. All this reflects the Lord’s mastery of the whole universe, which is created out of the mixing or revolving of the five elements and the universal mind and intellect. The Srivatsa or lock of hair on the Lord’s chest, which indicates the Goddess of Fortune, represents the products of the material creation, or the objects of enjoyment for which all living beings seek.7 And the gem, called Kaustubha (Treasure of the Ocean) represents the one who enjoys these products. Thus, this world of the enjoyer and the enjoyed is but a piece of decoration for the Lord, a spark of His energy. Lord Vishnu is also sometimes seen with additional items, such as a bow, called Sharnga. This represents the darker form of false-ego that makes one think he is nothing but the material body, not connected to the Lord. The arrows are the activities of the intellect, which can cut through false-ego when used properly. His fish shaped earrings represent the two processes of knowledge, such as through the sankhya (intellectual) and yoga (intuitive) methods. His armlets represent the three goals of worldly life, namely dharma (righteousness), artha (economic success) and kama (pleasure). Lord Vishnu’s crown represents the highest and incomprehensible reality. The yellow cloth that He wears (Pitambara) is said to indicate the Vedas. Through the Vedic hymns the divine reality is revealed, just as the Lord’s dark color can be seen through the cloth that He wears. And His sacred string, made of three threads, is said to indicate the three letters of the hallowed word AUM. The various forms of Lord Vishnu are composed of the different arrangements of the four symbols He holds in His four hands. For example, in one form He holds the conch in His lower right hand, the disc in His upper right, the mace in His upper left, and lotus in the lower left. In this form He has the name of Keshava, meaning the Lord with long hair, according to the Padma Purana (Book Four, Chapter 79). In other forms, in which case He holds the items in different hands, He has the names that include, Narayana (the universal shelter), Govinda (saver of the Earth and protector of cows), Madhava (Lord of knowledge), Madhusudana (the destroyer of the demon Madhu), Trivikrama (the one who conquered the three planetary systems), Vamana (the dwarf incarnation), Shridhara (the possessor of fortune), Hrishikesha (Lord of the senses), Padmanabha (whose navel produced the universal lotus), Damodara (who is self-restrained), Sankarshana (who reabsorbs), Vasudeva (one who dwells within), Pradyumna (who has the most wealth), Aniruddha (who no one can oppose), Purushottama (best of all men), Adhoksaja (the expanse of the universe), Nrisimha (the half-man and half-lion form), Achyuta (the inconceivable), Krishna (the dark and all-attractive one), Hari (He who removes obstacles or sorrow), Janardana (He who gives rewards), and Upendra (the brother of Indra). Many other names of Lord Vishnu are found in the Vishnu-sahasranam, the Thousand Names of Vishnu, located in the Anushasan Parva (149.14-120) of the Mahabharata. 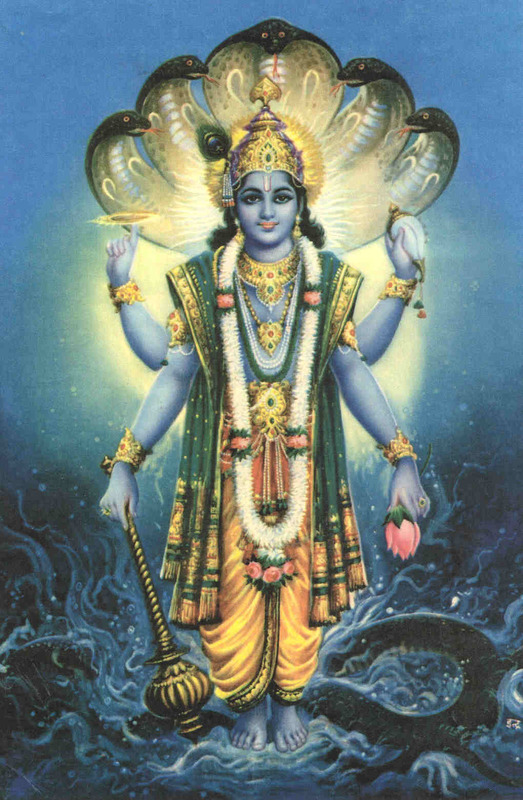 Lord Vishnu is also called Nilameghashyama for having a dark blue complexion. This represents a number of things, including pure consciousness, the infinite, and the all-pervading power. At other times Lord Vishnu is seen resting on the coils of the serpent Shesha, also called Ananta. Sheshanaga is the expansion of Lord Balarama, Lord Krishna’s brother, and serves the Lord in this way as the Lord’s support and paraphernalia. Shesha has a thousand heads swinging to and fro over the form of Lord Vishnu, creating a shelter and couch for the Lord. Ananta means endless, and Ananta is endlessly singing the praises and glories of the Lord from His thousand hoods without ever reaching the end. His hoods are also supporting the many planetary systems in the cosmic creation that are orbiting throughout the universe above His heads. Ananta also means endless in terms of the endlessness of cosmic time. This is also represented by His thousand hoods as divisions of time. The material worlds are created within the element of time, and are thus sustained by time. During the process of the universal annihilation, time ceases to exist, in which case the material planets are also forced into obliteration. Lord Shesha is often seen floating on the causal waters of the Garbhodaka Ocean, which exists on the bottom of the universe. Lord Vishnu is thus resting on Sheshanaga as They float on the ocean. At other times, They are viewed floating on the Kshiramudra, or an ocean of white milk. This represents the Prakriti or the ingredients of the unmanifest material nature in its purest form. Sometimes, Lord Vishnu is also seen riding on his carrier bird, Garuda. This is a half-man and half-eagle bird, whose name means “Wings of Speech.” It is described that he is huge and has a fierce expression. His color is that of molten gold. He has the head of an eagle with a red beak and feathered wings, and two arms like a man.8 Different divisions of the Vedas are parts of the body of Garuda. The sound of his wings reflect the utterances of the Vedic hymns, which can carry a person to another world with the speed of light and power of lightning. Thus, it is also the sound of the Veda that carries Lord Vishnu, and which can also transport Him into the hearts and minds of people. According to the Puranas, Garuda is a son of Kashyapa and Vinata, who was a daughter of Daksha.9 He is also the younger brother of Aruna. Garuda is known for his dislike of snakes, which he will eat. One reason for this is explained in the Mahabharata (1.20-35). Vinata once quarreled with her co-wife, Kadru, who was the mother of the serpent species known as nagas. It was from her that he inherited this hostility toward snakes. Then Garuda, with his wife Unnati, produced six sons, from whom descended all the bird species that eat snakes. Many people think that Lord Vishnu is the source of all other incarnations of God. This is true, but not in the case of Lord Krishna. Lord Krishna is actually the source of Lord Vishnu. When Lord Krishna descends into this world, He appears as Himself and not as an expansion of Lord Vishnu. To verify this, let me present the following details. Before the mahat-tattva, however, there is the pradhana, which is the sum total of all material energy in its subtle and undifferentiated stage. Material nature is always existing in its subtle form as the energy of the Lord. Sometimes, under the direction of the Supreme, it manifests its temporary existence in the form of the material cosmos. In spite of the fact that everything comes from the Supreme Being, He is still aloof from it all. He does not disengage Himself from His eternal pleasure pastimes with His devotees in the spiritual realm. So in the process of creating the material worlds, the Supreme expands Himself into various forms, which are His plenary parts. Krishna is the primeval Lord, the original Personality of Godhead, so He can expand Himself into unlimited forms with all potencies. They are no different from Him, but may exhibit differences in form. It is explained that Lord Krishna first expands Himself into Baladeva, or Balarama, who is considered Krishna’s second body and brother. Balarama assists in Lord Krishna’s innumerable spiritual pastimes in both the spiritual and material realms. All expansions of the Lord begin with Sri Krishna. For His pastimes in one of the highest levels of the spiritual realm, called Dvaraka, Sri Krishna expands Himself into Balarama, who then expands Himself into Pradyumna and Aniruddha. These four (Krishna, Balarama, Pradyumna and Aniruddha) expand into a second quadruple which is present in the unlimited Vaikuntha planets of the spiritual sky. The second quadruple is known as Vasudeva, Sankarshana, Pradyumna and Aniruddha. They are changeless, transcendental expansions of the Supreme Lord, Krishna. In this second quadruple, Vasudeva is an expansion of Krishna, and Sankarshana is a representation of Balarama. At the time of creation, after the Supreme has been sleeping for some time, the first emanations from the breathing of Lord Maha-Vishnu are the personified Vedas who serve Him by waking Him from His mystic sleep. They begin to enthusiastically sing His glories, pastimes, and praises, just as a King is awoken in the morning by poets who recite his heroic deeds.24 This shows the eternal nature of the Vedic literature. They are not merely the writings of men, but they are spiritual vibrations that exist before and after the material creation, and which emanate from the Supreme Lord. Once the Lord is awoken, He : casts His glance upon the material energy of maya. This glance is how the Supreme impregnates material nature with all the original seeds of the living beings. Thus, the Lord does not personally touch the material energy, but by His functional expansion He places the living entities into the material nature by His glance. Then maya, the material nature, becomes agitated.25 This functional expansion of the Lord takes the form as Shiva, known in this activity as Shambhu. It is Shambhu who carries the living entities in the glance of the Lord into the material energy. The Srimad-Bhagavatam (11.9.16-18) relates that the Lord of the universe, Narayana, Maha-Vishnu, is the worshipable Lord of all beings. With no other assistance, the Lord creates the universe by His own potency, and at the time of annihilation He destroys the universe through His expansion of time. He withdraws the complete universe and all materially conditioned living beings into Himself. In this way, His unlimited Self is the shelter and reservoir of all potencies. The Lord stands alone after the universal annihilation. He is the supreme worshipable object for all beings, such as liberated souls, demigods, and ordinary conditioned souls. He is eternally free from the material energy and constitutes the totality of spiritual bliss, which one can experience by seeing the Lord’s spiritual form. Thus the Lord exhibits the full meaning of liberation. The countless souls that appear within the material energy in the variegated species of life are all spiritual in nature, they are all spiritual beings. However, they can also become deluded by material energy. When they are thus deluded, they hanker for material activities and attractions. In order to accommodate this, the Supreme provides this material world as a playground in which they can work out their material desires. This means that regardless of species, whether it is Lord Brahma, or humans, animals, birds, or even tiny insects, material nature is the mother and the Supreme Lord is the seed-giving, universal Father. After agitating material nature into three qualities, which are the modes of nature in the form of passion, goodness and ignorance, they become active and material nature begins to give birth to the total material energy known as the hiranya-mahat-tattva. This is the sum total of cosmic intelligence. Thus, material nature becomes agitated by the destinations of the conditioned souls as determined by the influence of the modes of nature.29 Simply by the glance of Maha-Vishnu consciousness is created, which is known as the mahat-tattva. The predominating Deity of the mahat-tattva is Lord Vasudeva, another expansion of Lord Krishna. This explains how the material energy is like the mother of the living beings while the Lord is the Supreme Father of everyone. Just as a woman cannot give birth without the contact of a man, or at least his seed, so material nature cannot create without the contact of the Supreme Being. Garbhodakashayi Vishnu, who is known within the universe as Hiranyagarbha and Antaryami, the Supersoul, is glorified in the Vedic hymns. He is the master of each and every universe and shelter of the external or material energy. However, being transcendental, He is completely beyond the touch of the external energy. On that water He creates his own residence as an expansion of Vaikuntha and rests in the waters on the bed of the great serpent, Lord Ananta, Seshanaga.36 Although He appears to be in slumber, enjoying transcendental bliss in his internal potency, His eyes are slightly open. When He is ready to begin the act of creation, a golden lotus springs from his navel that becomes the birthplace of Lord Brahma. Within the stem of that lotus are the fourteen planetary systems.37 Then Lord Brahma is manifested as described in the previous chapter. Not only do the creations and annihilations of the cosmos go on continually, but the maintenance of the universe also takes constant supervision. It is explained that as long as the Supreme Being as Maha-Vishnu continues to glance upon nature, the material world continues to exist. Thus, the variegated flow of universal creation perpetually manifests through procreation.38 So, we can see that time and nature have no power to act independently, but are under the supervision of the Supreme. However, it is also described that it is not only the material nature that is maintained, everyone in it is also given the ability to act and function through the power of the Supreme in His form as the Supersoul. He creates the entire variegated universe and then enters into it as the Supersoul. Through this means He provides the life force and consciousness of everyone, and, thus, maintains the creation. As Sri Krishna further explains, “As the mighty wind, blowing everywhere, always rests in ethereal space, know that in the same manner all beings rest in Me.”39 As the Supersoul, He also enters into each planet, and by His energy they maintain their orbits.40 Thus, the Lord’s energy enters each planet, every living being, and : even each atom, by which everything is appropriately manifested and maintained. Without this, everything would revert back to chaos and deterioration. So because of the benediction and power given by the Supreme to the demigods, they can provide the living beings with all necessities. However, Lord Krishna explains in the Bhagavad-gita (3.14-15) that all living entities subsist on food grains, which are produced from rains, which is manifest through the performance of spiritual activities prescribed in the spiritual writings of the Vedic scripture and the teachings of the Lord and great sages. Consequently, the all-pervading Transcendence is eternally situated in acts of sacrifice. This is all a part of the process of how the Lord and His expansions of Vishnu maintain the world. As mankind engages in acts of sacrifice or spirituality, which simply means the worship of the Supreme, the Lord and the demigods are automatically satisfied to supply everyone with all necessities of life. In this way, there can be proper cooperation between man, nature and God so that everyone can be peaceful and content with the facilities for living in this world. 14. Ibid., Adi-lila, 5.41 & pur. 15. Ibid., Adi-lila, 2.56, pur. 18. Ibid., Adi-lila, 2.36, pur.